These tools helped a lot to web developers and made their life easy. But I never got satisfied with these developer tools and always thought to have something integrated with Visual Studio only. As above I always felt a disconnect between aspx/ascx/master… code and the rendered HTML. Although I used above tools a lot to get the flaws of rendered HTML, lists it down, then find out the correct mapped code and fix the issues. But this is not just a one way process. Some times this become a very long cyclic process. As we all know that most of the time a rendered page is not just a result of single file but it comprises many user controls, master page, base page etc. 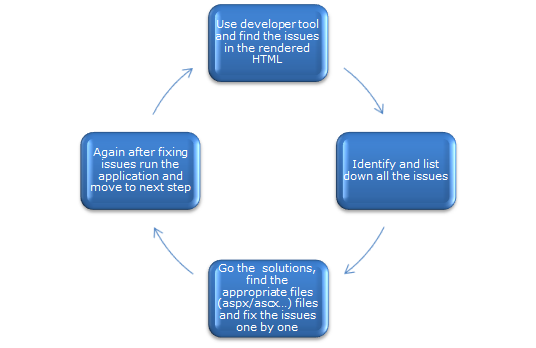 So even if you have list of problems that you have found using several tools. The next Herculean task is to find the exact file where the issue belongs and then fix it. It becomes more tedious when you yourself not developed the application. What if we have some tool that is tightly coupled with Visual Studio only to find the issues and rectify at their only, as we develop our application on Visual Studio only. 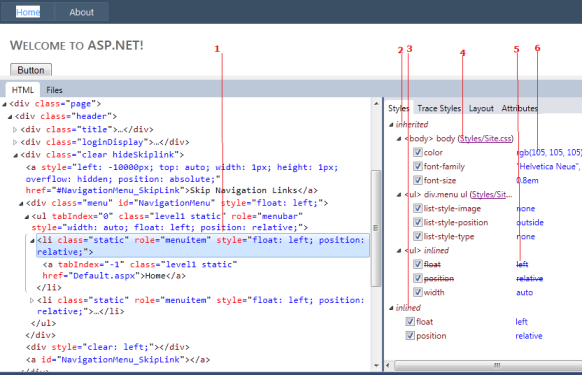 Microsoft has come up with the page Inspector that is integrated with Visual Studio 11 developer’s preview. Note: This post uses developers preview not a beta or final release. So you might face few issues while using but hope all these will be taken care in final release. 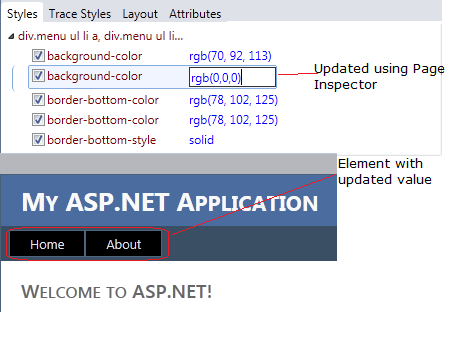 As per Microsoft “Page Inspector is a new tool that brings browser diagnostics tools into Visual Studio and provides an integrated experience between the browser, ASP.NET, and source code.Page Inspector bridges a gap in web development between the client (browser tools) and the server (ASP.NET and source code) by bringing together the best of both worlds using a combined set of features”. 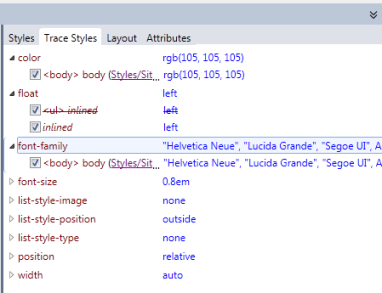 As I mentioned that Page Inspector works only with Visual Studio 11 Developers preview. It requires ASP.NET 4.5 and. It does not come directly with VS 11, It is like addin you need to install it in your VS 11. You can install using Web Platform Installer with the following link. Note: While publishing this article, Visual Studio 11 bets got released. 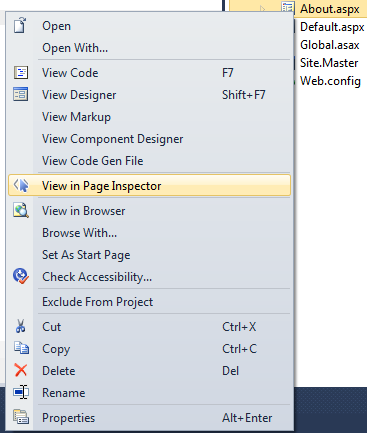 In this release Page inspector is part of Visual Studio i e you don’t need to install anything for Page Inspector. When we run the Page Inspector it does few steps. – Open the page with Page Inspector. and it adds the following in appsettings. As it says we need to remove this settings while deploying on production, because it requires lot of matadata to be generated that is used by Page Inspector. Which is not required on Production and adds extra overhead. Whenever any change is made in any source file, Page Inspector prompts to refresh the page to see the changes as below. 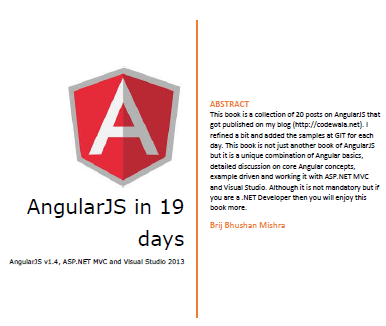 Page Inspector works with Website and Web Application type of Projects. So to run the Page inspector, you will get an option “View in Page Inspector” option if the Page inspector is properly installed. Alternatively you can use the command Ctrl+K, Ctrl+G to view the page in page inspector. It opens the current active page. So I have created a sample default ASP.NET project for the demonstration. So lets see its first view. So Lets discuss the pointers one by one. 1: Normally in any browser diagnostics tool we just able to see browser page view and the rendered part i e HTML, CSS etc. But in Page inspector it also marks the corresponding server files i e aspx, ascx, master etc. 1 B : Associated server side mark up. As soon as you select an element in page inspector, corresponding mark up in server side file gets highlighted. As one knows as a page is not a result of just single file normally. Page Inspector navigates to the associated file and opens it to highlight the element. As here currently, two files used so it is showing those. Attributes: Lists down all the attributes applied to selected element. It gives you option to add and remove the attributes. 1: The selected element on HTML. 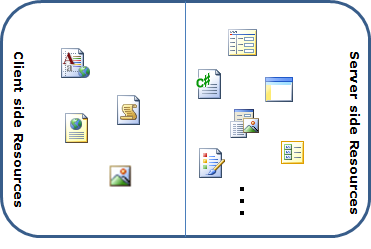 2: In style tab, It is divided in two sections : inherited and inlined. inherited inludes all the style that are inherited from other elements. 3: inlined : It list down all the attributes that are applied to current element. 4: It is the hyperlink where the css attributes resides. 5: As we know, if there are multiple attributes are applied on any element so higher precedence is given to inlined element. So there are some attributes which is not applied or overridden so marked as cut. 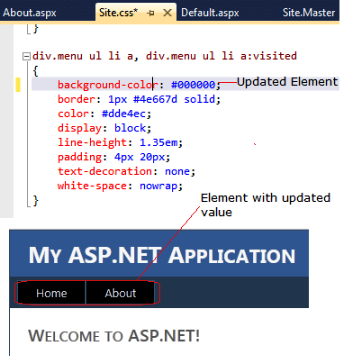 6: You can just double click on the element to update. Let’s view another tab that is Trace styles. Attribute: This attribute tab list down all the attribute applied to the selected element. It also allows to add or remove any attribute to see the behavior. and also we have an option to update the style from Page Inspector’s style tab like other developer tools. will be used by the developers a lot. 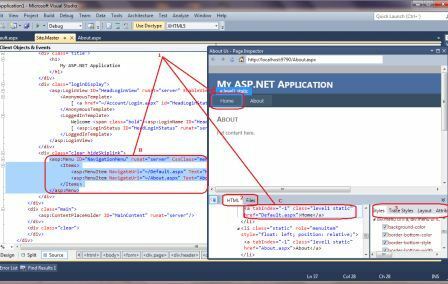 This entry was posted in ASP.NET 4.5, Visual Studio Tricks and tagged .net 4.5, Page Inspector, Visual Studio 2011. Bookmark the permalink.